HG Contemporary and Philippe Hoerle-Guggenheim represented “BREATH ing HEART,” an interactive art installation by multimedia artist Johanna Keimeyer this month at Art Basel 2017 in Switzerland. The installation combines architecture, light, scent and music to create a unique interactive experience. This walk-in heart can accommodate up to 20 people at once and was built in the historic water filter building Filter4. It will then be brought to the United States by HG Contemporary. The heart fills itself with air and pulses in a breathing rhythm accompanied by light, scent, and sound within the 1600 m2 (5.250 ft2) historic water filter building. Visitors will get the unique opportunity to experience being inside their own body while being guided by the artist’s voice via headphones. Exhibition Monday, June 12th - Sunday, June 18th 2017 every day 1 - 10 pm (except Sunday: 1 - 8pm). Live performance every day from 3 - 4 pm. An impulse for the project was given by the support of Fredy Hadorn from Licht Feld Gallery who runs the Filter4 exhibition space in Basel. Kling Klang Klong will now provide the sound concept and composition and Studio Farbraum will lead the LED programming. The artist started her crowdfunding-campaign and succeeded in winning Novartis as a major sponsor for the realization of the interactive heart object (diameter 10 meters/ 32 feet). Speakers of the British manufacturer Bowers & Wilkins ensure the implementation of the sound field and strongly support the project as well. Mezeaudio also joined, providing headsets. Open Innovation Space has supported the project with 3D printed parts and K. Schweizer with electrical engineering. KIRRON light components shine with establishing their innovative DycoLED light system. Emil Frey AG Autocenter Münchenstein provided the cars for the shuttle service. The renowned Berlin film production company Picsters are documenting the project. Philippe Hoerle- Guggenheim, founder of HG Contemporary Gallery NYC, represents the project for the United States. Monday, June 12th - Sunday, June 18th 2017 from 1 - 10 pm (except Sunday 1-8pm) with live performances every day from 3 - 4 pm. Johanna Keimeyer (born 1982) studied design und digital media at University of the Arts (UdK), Berlin, at Tama Art University Tokyo, and at Rhode Island School of Design (RISD), USA and MIT Media Lab, Boston, USA. After crafting lamp creations made of recycled materials, she now transforms architectural highlights into emotional experiences with video, light, scent and sound as a multimedia artist. Johanna Keimeyer’s work is in the art collections of Alexander von Vegesack (former Vitra Design Museum Director), Petch Osathanugrah (O Museum Bangkok), Hugues and Marie Taittinger (Champagne Brand France), Lucas Verweij (Design Author) and more. She has worked with Ingo Maurer (light design), Humberto and Fernando Campana (furniture design, Brazil), Bart Hess (design), Felix Kubin (musician) Sven Helbig (composer), Sevil Peach (architect), Jonah Bokaer (choreography) to name a few and for two years she worked for Vitra Design. As shown in Basel, Switzerland in the historic Filer4 water fileter building. Philippe Hoerle-Guggenheim represented the installation for the U.S. there and will bring it to the United States after it's displayed in Germany. 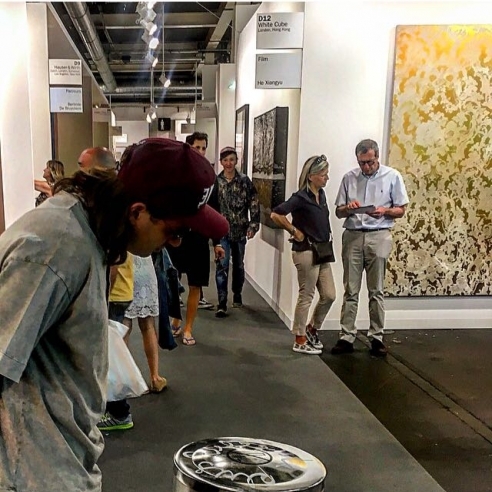 Artist Massimo Agostinelli provoked Art Basel viewers into thinking a garbage bin was in fact a work of art on exhibit at the fair by simply writing on it in French with acrylic pen.